You may be wondering . 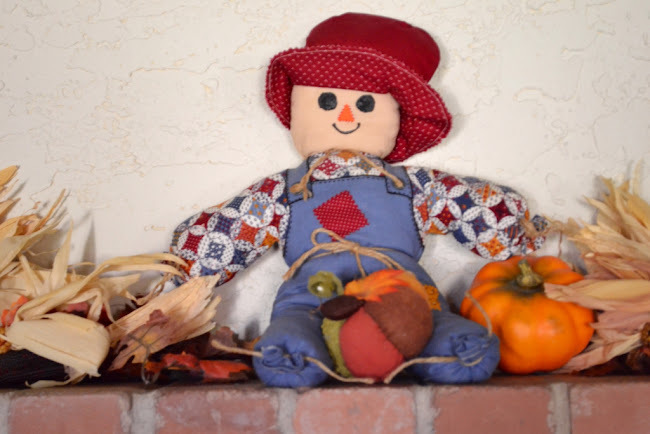 . . Just what is the difference between dressing and stuffing? Dressing and stuffing are made exactly the same way! Stuffing is "stuffed" in the empty cavity of the turkey, and steams inside the bird while it's roasting. Dressing is baked "outside" the bird in a buttered baking dish. Especially with the larger turkeys, there is a risk of the stuffing and bird not getting up to proper internal temperature and the possibility of food poisoning. To avoid this serious situation, I pull my icy, brined turkey out a 1/2-hour before stuffing and rinse it, inside and out, with warm water to remove chill, and then pat dry. Because I make my stuffing a day ahead of time, I warm the cold dressing "before" stuffing my bird, and to avoid this problem. Turkey parts, 2 turkey backs, a wing and turkey neck from the bird you plan to roast. Place ingredients in stock pot and simmer for 3 hours. Remove turkey parts, cool and remove meat from bones. Remove veggies from broth; cool broth in fridge. Remove hardened fat from top of broth. I ended up with 4 delicious cups of turkey broth. Will absolutely LOVES my dressing, so, when I make it, I make a whole lot! We eat it on Thanksgiving . . . for 3 days after with leftovers . . . I also freeze it in quart freezer bags to use throughout the year! Moist, meaty, savory, and sweet with a crunch on top! . . . Julie's Dressing, is a meal in itself!!! 2 1/2 - 3 cups turkey broth or chicken broth. Heat 1 tablespoon butter in a large skillet over MEDIUM heat; sauté slivered almonds for 3 minutes. DUMP into extra large bowl or wash basin (I started with a large bowl and didn't have enough room, so switched to our camping wash basin. A hot water bath canner will also work). 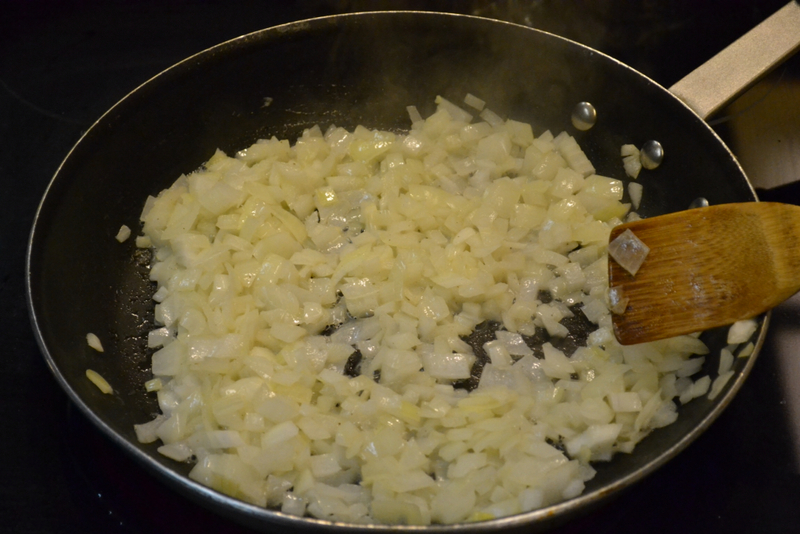 With skillet still on medium, melt 2 tablesopoons of butter; add chopped onions, sautéing 2 minutes. 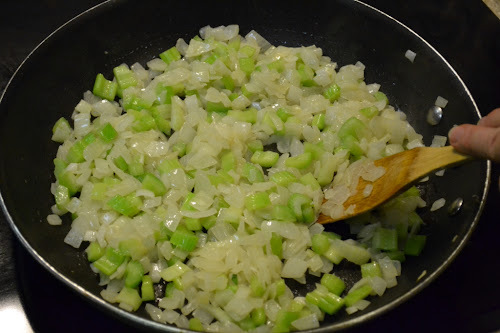 Add chopped celery to onions; sauté 4 additional minutes. 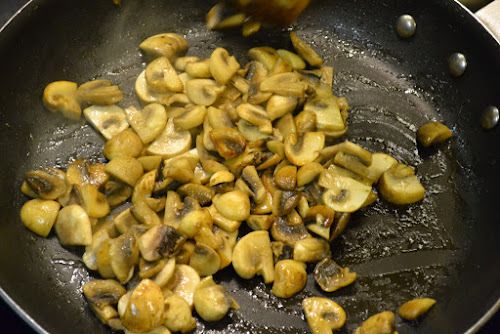 Add 3 tablespoons butter; sauté mushrooms, until nicely cooked. Add sausage to skillet, sauté until browned; add sage, thyme, rosemary, dried pepper flakes stirring for 1 additional minute. 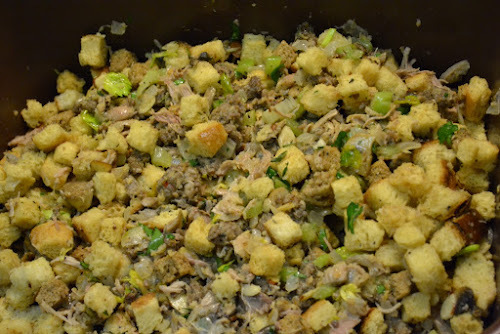 Add cooked turkey meat, salt and pepper to DUMP bowl or wash basin; toss well. Add cubes of dried bread; toss well. Drizzle 1 cup warm turkey broth over stuffing mixture, toss using clean hands*. Add an additional 1 cup turkey broth, toss again. Add crumbled corn bread, toss to incorporate using hands*. Add an additional 1/2 cup turkey broth, toss using hands*. 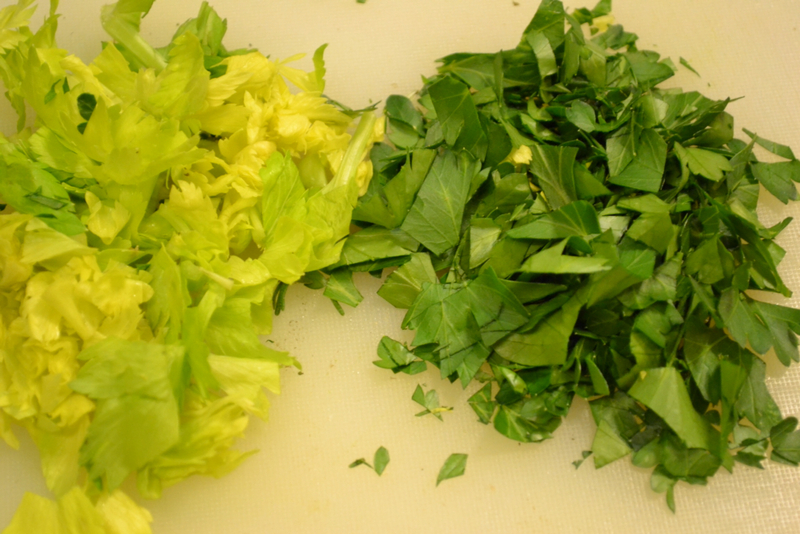 Julie's Tip: Using your hands to mix the dressing will give you a "feel" for how much broth to add. 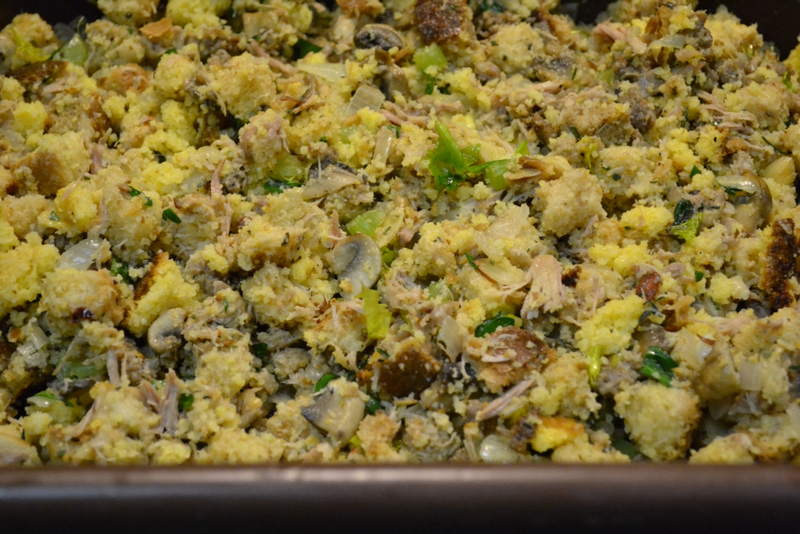 Julie's Tip: I stuff my turkey and also bake a pan of stuffing. When the turkey is done, remove stuffing immediately! Mix stuffing with dressing and serve pipping hot! 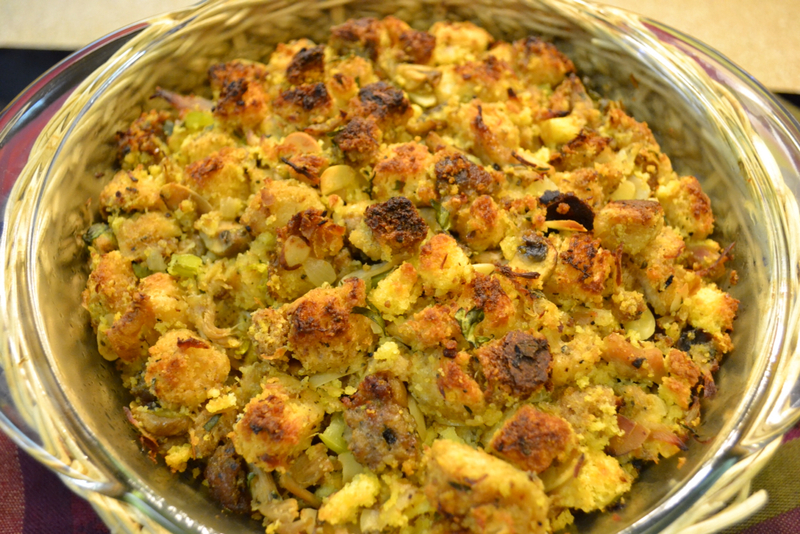 FOR STUFFING: Allow 1/2 hour to stuff your turkey and warm your stuffing. FOR DRESSING: Turn dressing into a buttered 3-quart baking dish. Cover with foil and bake until steamy, 30 minutes. Remove foil; bake until crusty, 10 minutes longer. Photo for sautéing almonds didn't come out well. Sauté onions . . . DUMP into large basin. Celery should have a little bite to it . . . It's all about texture! When finished . . . DUMP! Sauté fresh mushrooms and DUMP! 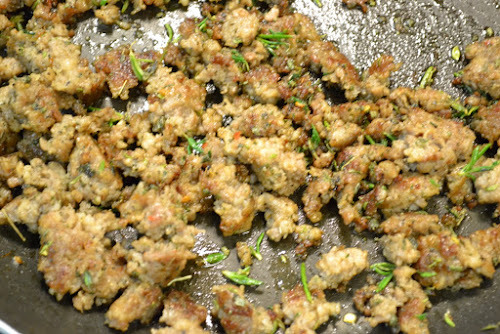 Brown sausage, then add herbs and pepper flakes stirring for another minute. 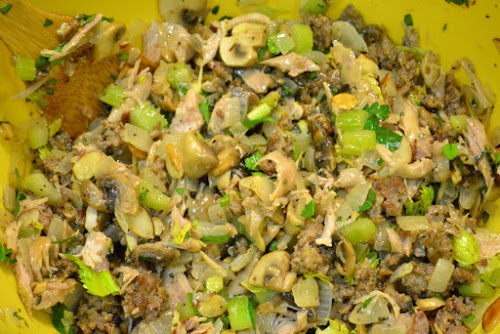 DUMP sausage and turkey along with chopped celery leaves and parsley. Mix meat and veggies together. Add broth; tossing between additions, with clean hands. 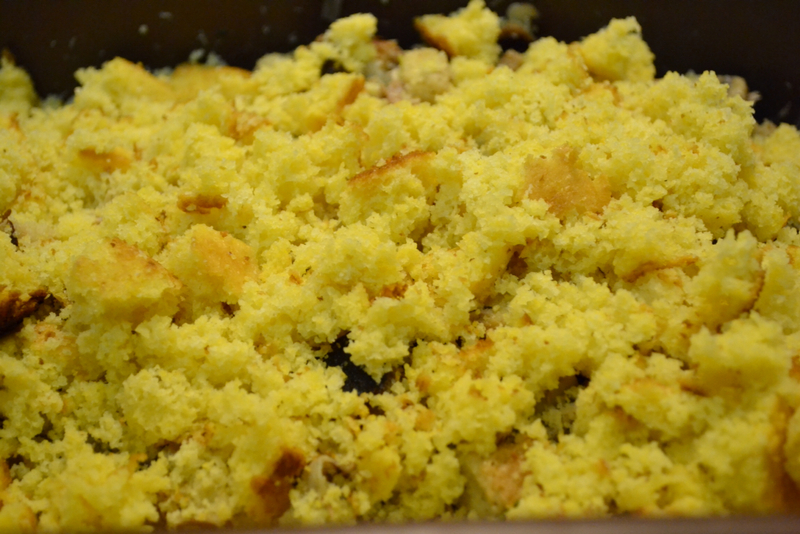 Crumble corn bread into DUMP basin; toss with clean hands to mix. Add 1/2 cup of warm turkey broth and toss with hands. 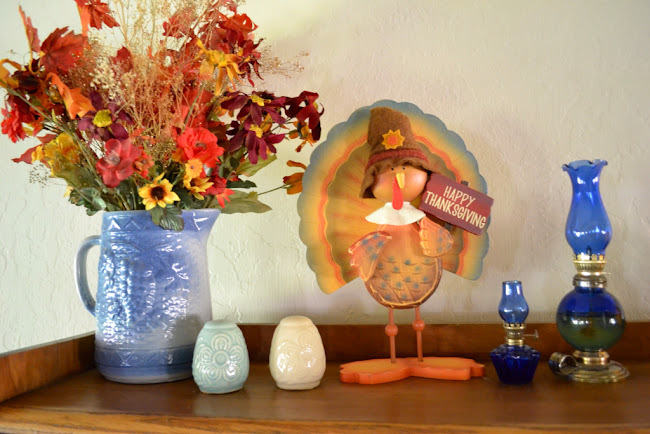 On Thanksgiving Day we gather to feast, like the pilgrims and Indians did back in 1621. Our 16th president, Abraham Lincoln, declared the last Thursday of the month of November to be a Day of National Thanksgiving "for the blessings of fruitful fields and healthful skies . . . from the ever-watchful providence of Almighty God" . . . "It is a Day of Thanksgiving and Praise to our Benificent Father who dwelleth in the heavens." Grateful for all He has done . . . Over at Julie's!! !